Cottage Elements: Great Tips for a Garage Sale! 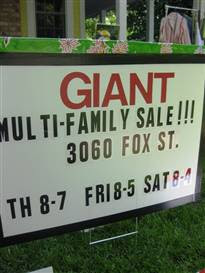 Great Tips for a Garage Sale! It's that time of year and for those of us in the Junking biz, we're usually on the other end of things, out looking for more stuff, not selling. But if you need some tips for getting rid of those things we bought on impulse, out grew or no longer have any use for, Sue Whitney of JunkMarket has some great tips! After another visit to New York and the Today Show, she got to spend some one on one time with Matt Lauer (lucky her). But of course she was just spreading the Junk "Love" discussing her great tips for putting on a garage sale. So if you missed it, or just want to see it again, here it is! And if you want more info, here's a link: Your junk, their treasure 11 garage sale tips. Here's to a great season of garage sale selling . . . .and buying! Great tips! I just had a yard sale and did ok...I like the idea of small grab bags. I have crating pieces that would be great for. Hey, Mr. DJ . . .